Valda-Christine Glennie was born in London, Ontario and spent her high school years in England at Roedean in Brighton, Sussex. After graduating she returned to Canada and earned her B.A. at the University of Western Ontario. Inspired to continue learning, Valda-Christine explored academic channels that allowed her to combine her artistic abilities with her interest in science. She enrolled in Art As Applied to Medicine offered by University of Toronto, an intensive program which covered anatomy, embryology, physiology, neurology, ophthalmology and dental anatomy. Upon graduation with a B.Sc. A.A.M. 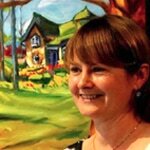 Valda-Christine began freelancing in Toronto providing medical illustrations for educational, publishing and pharmaceutical markets.